Folate is essential for cellular proliferation and tissue regeneration. As mammalian cells cannot synthesize folates de novo, tightly regulated cellular uptake processes have evolved to sustain sufficient levels of intracellular tetrahydrofolate cofactors to support biosynthesis of purines, pyrimidines, and some amino acids (serine, methionine). Though reduced-folate carrier (RFC) is one of the major proteins mediating folate transport, knowledge of the developmental expression of RFC is lacking. We utilized in situ hybridization and immunolocalization to determine the developmental distribution of RFC message and protein, respectively. In the mouse, RFC transcripts and protein are expressed in the E10.0 placenta and yolk sac. In the E9.0 to E11.5 mouse embryo RFC is widely detectable, with intense signal localized to cell populations in the neural tube, craniofacial region, limb buds and heart. During early development, RFC is expressed throughout the eye, but by E12.5, RFC protein becomes localized to the retinal pigment epithelium (RPE). Clinical studies show a statistical decrease in the number of neural tube defects, craniofacial abnormalities, cardiovascular defects and limb abnormalities detected in offspring of female patients given supplementary folate during pregnancy. The mechanism, however, by which folate supplementation ameliorates the occurrence of developmental defects is unclear. The present work demonstrates that RFC is present in placenta and yolk sac and provides the first evidence that it is expressed in the neural tube, craniofacial region, limb buds and heart during organogenesis. These findings suggest that rapidly dividing cells in the developing neural tube, craniofacial region, limb buds and heart may be particularly susceptible to folate deficiency. Folates are highly lipophobic, bivalent anions that can only minimally traverse biological membranes by simple diffusion . Because they pass so inefficiently through biological membranes, supply of folates through mammalian cell plasma membranes must occur by a mediated process . Reduced-folate carrier (RFC; additionally known as RFC-1, FOLT, RFT-1 or SLC19A1) (Mr 60 kDa) is a typical transport protein with 12 membrane-spanning domains. RFC preferentially transports reduced folates, such as N5-methytetrahydrofolate (MTF), the most common form of circulating folate. In adult tissues, RFC is expressed in the brush-border membrane of jejunum, ileum, duodenum and colon and in the basolateral membrane of renal tubular epithelium, hepatocytes, choroid plexus  and the retinal pigment epithelium (RPE) of the eye . The importance of RFC during embryogenesis has been demonstrated by the use of targeted gene deletion. Mice with targeted deletions of RFC die at an early embryonic age . Thus, although it is evident the RFC is needed for normal embryonic development, the tissue-specific requirements for RFC during embryogenesis remain largely a mystery. In the present study we offer the first developmental analysis of the embryonic tissue Distribution of RFC message and protein in mouse placenta and developing embryo. In situ hybridization analysis was performed on cryosections of mouse uterus obtained at embryonic day (E)10.0 of gestation. Figure 1A shows that RFC message is expressed in trophoblast cells of all layers of the placenta, with the expression most abundant in the trophoblast cells surrounding blood lacunae. RFC message was expressed also in the trophoblastic giant cells, labyrinth, junctional zone, yolk sac and within the neural tube of the developing embryo (Figure 1A and 1C). Specificity of the staining was verified by hybridization of placental sections with an RFC specific sense probe as a negative control (Figure 1E). The presence of RFC protein in mouse placenta was determined by immunofluorescence using frozen sections of E10.0 day mouse placenta. RFC-specific antibody  produced immune reaction in trophoblast cells of all layers of the mouse placenta (Figure 1B). RFC message was detected abundantly in the trophoblast cells surrounding blood lacunae in the labyrinth zone. Immunofluorescence showed that RFC protein was present widely throughout the placenta with particularly intense expression in the trophoblastic giant cells, the yolk sac and within the neural tube of the developing embryo (Figure 1B and 1D). Specificity of the RFC antibody was confirmed by the lack of fluorescence in tissues incubated with RFC antibody previously treated with blocking peptide (Figure 1F). In situ hybridization and immunolocalization of RFC during early murine embryonic development. Panels A and C demonstrate expression of RFC mRNA in a section of uterus containing an E10.0 embryo. Panel E demonstrates the absence of background staining when a sense riboprobe for RFC is hybridized with placental sections as a negative control. 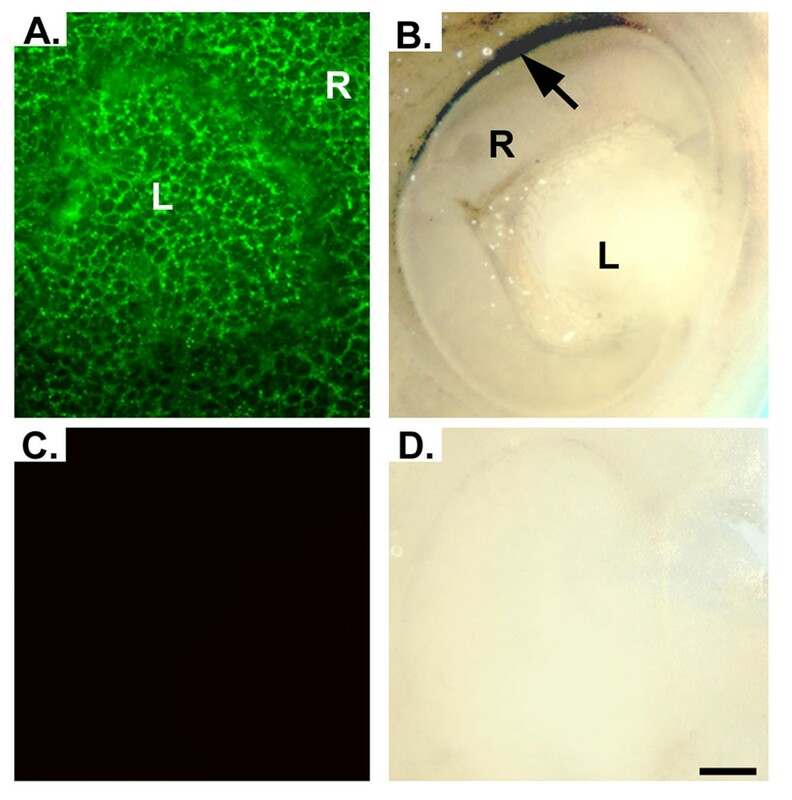 To determine whether RFC protein may be localized to the same areas that are positive for RFC message during murine embryonic development, immunofluorescence was utilized in E10.0 frozen uterus sections. Panels B and D indeed verify that RFC protein is localized in a manner consistent with the expression pattern of RFC message. Specificity of the RFC antibody is demonstrated by lack of fluorescence in tissues incubated with RFC antibody that had been pre-incubated with blocking peptide (Panel F). L, labyrinth zone; NT, neural tube; JZ, junctional zone; TG, trophoblastic giant cells; YS, yolk sac. Scale bar represents 25 μm in A and E and 4 μm in B, C and D.
Further analysis of RFC mRNA expression was carried out utilizing mouse embryos ranging from E9.0 to E11.5 (Figure 2). Three or more embryos were examined for each time point. RFC message was detectable in all tissues throughout the embryos, with the most intense levels of expression being confined to the forebrain, hindbrain, craniofacial region, eye (optic vesicles), mandible, heart, somites, and tail (Figure 2A). 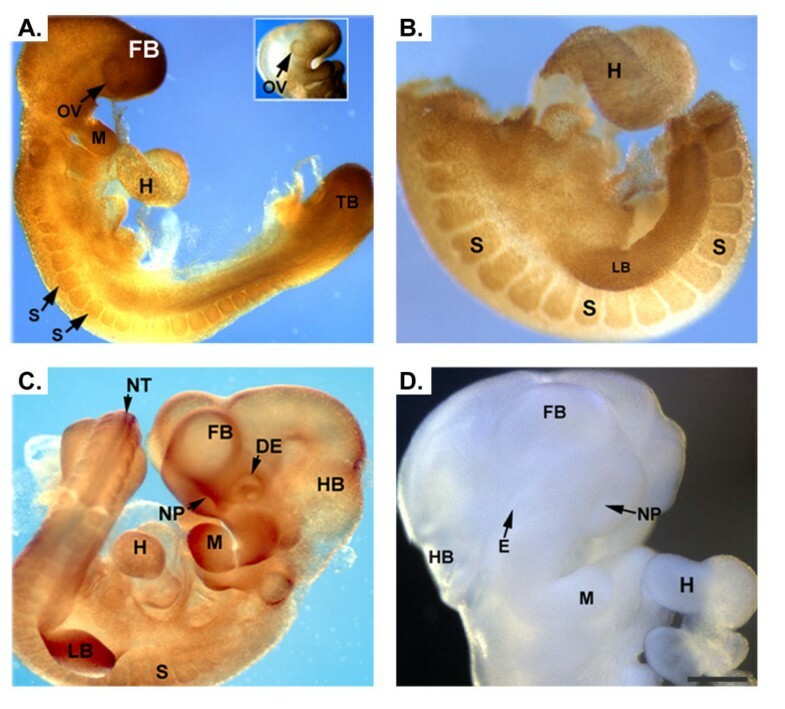 In E10.5 (Figure 2B) and E11.5 (Figure 2C) embryos, expression in the forebrain, hindbrain, craniofacial region, eye (optic vesicles), mandible, heart, somites, and tail were maintained, while additional expression became detectable in the developing limb buds. Faint signal was also visible in the yolk sac (data not shown). Negative control experiments with sense riboprobes for RFC resulted in minimal background staining (Figure 2D). Analysis of RFC mRNA transcripts in E9.5-E11.5 mouse embryos. RFC mRNA was widely expressed; however, structures undergoing developmental changes requiring rapid cell division expressed the mRNAs most strongly. Panels A-C demonstrate expression of RFC mRNA in embryos varying in age from E9.5 to E11.5. Light purple staining indicates the widespread nature of the RFC message. Regions of more intense staining include the forebrain, eye, hindbrain, mandible, heart, limb buds, somites, tail and yolk sac. Panel D depicts a control in situ hybridization performed with RFC sense riboprobes. Lack of background staining verifies that the signal in the experimental specimens is specific. Forebrain, FB; eye, E; hindbrain, HB; mandible, M; heart, H; limb buds, LB; somites, S; tail, T. Scale bar represents 50 μm. The distribution pattern of RFC protein in E9.0 through E10.5 ICR mouse embryos was determined by whole-mount immunohistochemical localization. Positive signal was ubiquitously present, but at E9.0 the signal was most intense in the optic vesicles, forebrain, mandible, heart, somites and tail bud (Figure 3A). At E9.5 RFC protein was detectable in the developing limb buds (Figure 3B) and by E10.5, besides being present in the developing eye, forebrain, hindbrain, somites, mandible, heart and limb buds, RFC was detectable also in the neural tube and nasal pits (Figure 3C). Control experiments in which tissues were incubated with pre-blocked primary antibody exhibited little background staining (Figure 3D). Immunohistochemical detection of RFC in developing mouse embryos. Panels A and B demonstrate staining for RFC in an E9.0 and E9.5 embryo, respectively. Positive signal is detected throughout the embryo, with the signal being more intense in the optic vesicles, mandible, heart, somites, limb buds and tail bud. At E10.5 (panel C) expression of RFC is present in the aforementioned tissues as well as in the neural tube, nasal pits and developing eye. Control embryos incubated with pre-blocked antibody demonstrated no signal (Panel D). optic vesicle, OV; mandible, M; heart, H; somites, S; limb buds, LB; tail bud, TB; neural tube, NT; nasal pits, NP; developing eye, DE. Scale bar represents 50 μm in A, C, E and F and 100 μm in B and D.
In addition to localizing RFC in numerous tissues of the developing embryo as shown in figure 3, we were particularly interested in its localization in the developing eye. Our laboratory has evaluated this protein in adult retina [3, 5]. As shown in figure 4A RFC was present throughout the developing lens and retina at E10. As development continues through E12.5, RFC signal becomes undetectable in the lens, while signal in the retina becomes confined to the retinal pigment epithelium (RPE) (Figure 4B). Expression appeared to be greater in the dorsal RPE as compared to the ventral RPE (Figure 4B). Control experiments performed with either fluorescent secondary antibody (Figure 4C) or horse-radish peroxidase conjugated secondary antibody (Figure 4D) gave little background. Immunofluorescent and immunohistochemical detection of RFC in developing mouse eye. Panel A demonstrates immunofluorescent signal for RFC present throughout the developing retina and lens of an E10.0 ICR mouse embryo. As development continues through E12.5, signal in the lens diminishes, while the signal in the retina becomes confined to the RPE (Panel B). Expression appears to be greater in the dorsal region of the retina (black arrow). Sections incubated with pre-blocked antibody demonstrated no signal (Panels C and D). R, retina; L, lens. Scale bar represents 10 μm. 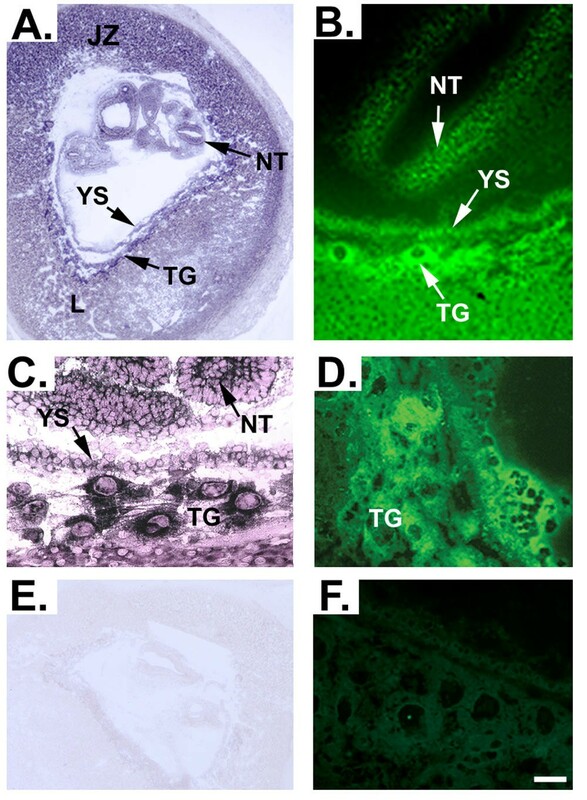 In trans-uterine sections of E10.0 pregnant mouse uterus, we found that RFC mRNA and protein were widely distributed throughout the placenta. While studies by Wang et al. suggested that RFC expression in adult tissues is confined to specialized cell types such as the brush-border membrane of the jejunum, ileum, duodenum, and colon or the basolateral membranes of renal tubular epithelium, hepatocytes and choroid plexus, more recent studies suggest a more ubiquitous expression in adult tissues . In accordance with these recent findings, in situ hybridization and immunolocalization analysis of whole-mount embryos revealed that RFC mRNA and protein were widely present. At E9.0 the signal was most intense in the optic vesicles, forebrain, mandible, heart, somites and tail bud. By E10.5 RFC was also detectable in the neural tube, limb buds and nasal pits. In the eye RFC mRNA and protein were expressed ubiquitously through E12.0. By E12.5, However, the RFC protein was no longer present throughout the developing eye; instead it had segregated to the apical plasma membrane of the RPE, its adult location in the eye . This study has important clinical implications concerning the mechanism by which the beneficial effects of folate supplementation during pregnancy are derived. Many studies have shown a statistically significant decrease in the number of neural tube defects (NTD's) suffered in offspring of female patients who were given supplemental vitamins containing folate during pregnancy [7–9]. To a lesser extent, folate supplementation has also been shown to decrease the incidence of craniofacial abnormalities [10–12], cardiovascular defects [13, 14] and limb abnormalities  in humans. This work demonstrates that RFC mRNA and protein are present in rapidly dividing cell populations of the mouse embryo during early organogenesis of these structures. The pattern of RFC mRNA and protein expression is developmentally regulated. While RFC expression is most strongly present in specialized cell-types in adult mice, during development RFC mRNA and protein are expressed in the placenta, yolk sac and throughout the embryo, with higher levels of expression being confined to cell populations in the neural tube, forebrain, hindbrain, craniofacial region, eye, limb buds, heart, somites and tail. Mutations in the RFC gene or deficient maternal folate intake may lead to developmental defects by decreasing proliferation rates in the cell populations determined by this study to express high levels of RFC during development. ICR male and female mice were purchased from Harlan Sprague Dawley (Indianapolis, IN). Timed pregnancies were obtained by checking mating plugs and the morning a plug was detected was defined as E0.5. 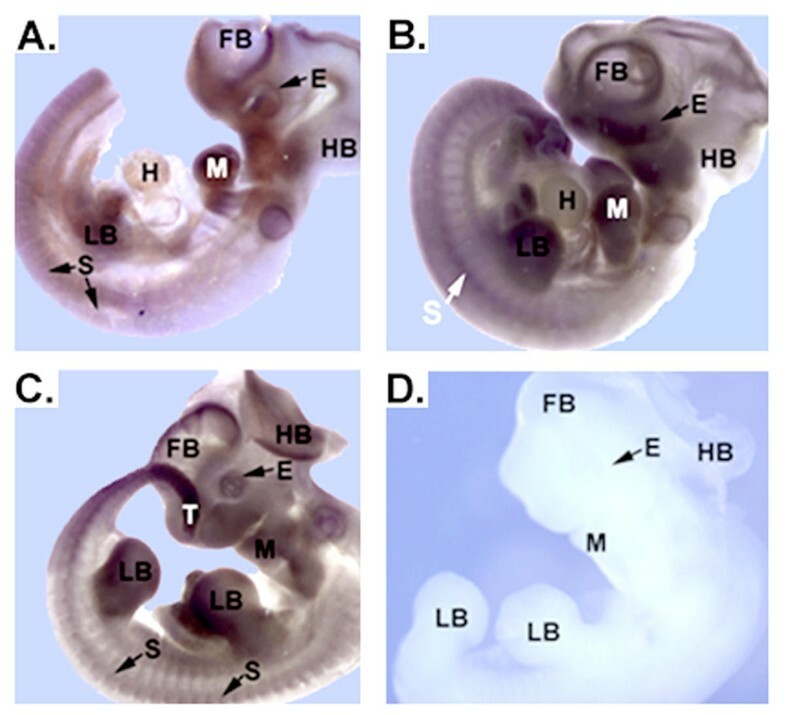 Pregnant female ICR mice were sacrificed by cervical dislocation, the uterine horns opened immediately and the embryos collected in cold diethyl pyrocarbonate (DEPC)-treated (0.01 M) PBS. Care and use of mice adhered to the principles set forth in DHEW Publication NIH 80–23 (Guiding Principles in the care and use of animals). The sense and antisense digoxigenin (DIG)-labeled cRNA probes for mouse RFC transcripts were prepared using a DIG RNA labeling kit (Boehringer Mannheim, Indianapolis, IN) following the manufacturer's protocol. The cDNA used to generate cRNA probes was obtained by reverse transcriptase polymerase chain reaction (RTPCR) performed on total eye RNA using the primers 5'-AGCGATAAGCCTACAGGATGG-AGACCTA-3' (sense) and 5'-CTGCAGGCTCAGCGGACCTTGGCT-3' (antisense) which amplified a 618-bp fragment between bases 1558 and 2175 of the published RFC sequence (Genbank accession number NM031196) . The amplified product was cloned into pGEM-T vector in an orientation producing sense probe by T7 RNA polymerase-mediated transcription and antisense probe by SP6 RNA polymerase-mediated transcription. The identity of the amplified products was confirmed by nucleotide sequencing and in situ hybridization was performed as previously described . Specimen were photographed without clearing using a Zeiss Axioskop microscope or a Zeiss Stemi-2000 C dissecting scope equipped with a Spot camera. Immunohistochemistry on cryosections was performed as previously described . Whole embryos were processed for immunohistochemistry by fixation in 4% PFA for 2 h at 4°C followed by rinsing in PBS. Embryos were dehydrated through a graded ethanol series and the tissues were re-fixed with methanol:dimethylsulfoxide (DMSO) (4:1) overnight at room temperature followed by methanol:DMSO:30% H2O2 (4:1:1) at room temperature for 4 h. Embryos were rehydrated through reverse ethanol series. Nonspecific binding was blocked by incubating the embryos in PBSTMD (2% skim milk powder, 1% DMSO in PBS containing 0.1% Tween 20). The RFC-1 anti-peptide antibody was raised against the peptide sequence RPKRSLFFNRDDRGRC, corresponding to residues 205–220 of human RFC-1 and was used at a 1:500 dilution [3, 18]. The specificity of this antibody has been described . Control experiments were carried out by incubating the antibody with the RPKRSLFFNRDDRGRC peptide at a concentration of 2 μg/ml for 30 minutes prior to beginning the experiment. Incubations were carried out in PBSTMD overnight at 4°C. The antibody solution was removed and embryos were rinsed twice with PBS following which they were washed 4 × 1 h in PBST. Embryos were blocked with PBSTMD for 4 h, the secondary horse-radish peroxidase (HRP)-conjugated antibodies were added in PBSTMD (1:100) and the embryos were incubated overnight at 4°C. Embryos were rinsed 2× with PBS and washed for 4 × 1 h in PBST before being incubated for 1 h in 500 μl DAB solution (1 mg/ml in PBST). 500 μl of 0.03% H2O2 was added and 3–5 minutes were allowed for the color to develop before the embryos were rinsed in PBS and photographed using a Zeiss Axioskop microscope equipped with a Spot camera. We would like to thank Sue Johnson for help in the preparation of this manuscript. We would like to thank Dr. Pamela Martin for technical advice. This work was supported by National Institutes of Health Grants EY 12830 and HD 37150-01. DM performed the in situ hybridization studies, the whole-mount immunohistochemical studies and prepared the manuscript. AM and PR prepared the histological sections for this study and AM performed some of the immunohistochemical and immunofluorescence experiments. PP and VG participated in the design and coordination of this study. SBS conceived of the study, and participated in its design and coordination and advised in the preparation of the manuscript.